I have tried many ways to carry firearm concealed. 5.11 comes with a new idea, which is carrying the weapon actually on the undershirt. The material it's made of is Poly/spandex blend and the shoulder pockets have Velcro. On 5.11 web site, it says the shirt also has a Moisture wicking technology. The current retail price for regular shirt is $70 and $75 for V-neck and for the sleeveless shirt. My recommendation is go with V-neck shirt as the crew-neck shirts appeared to be too tight in the neck area. I am 6'2" and used Medium shirt, which fit me just fine. 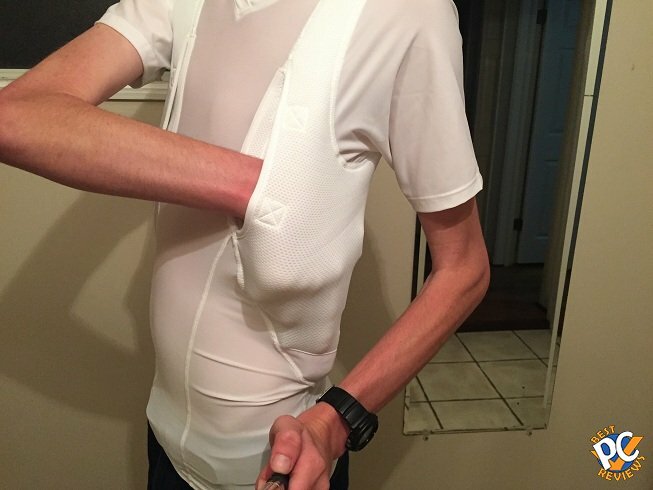 It's easy to put the shirt on, but its pretty hard to take the shirt off after wearing it for several hours. 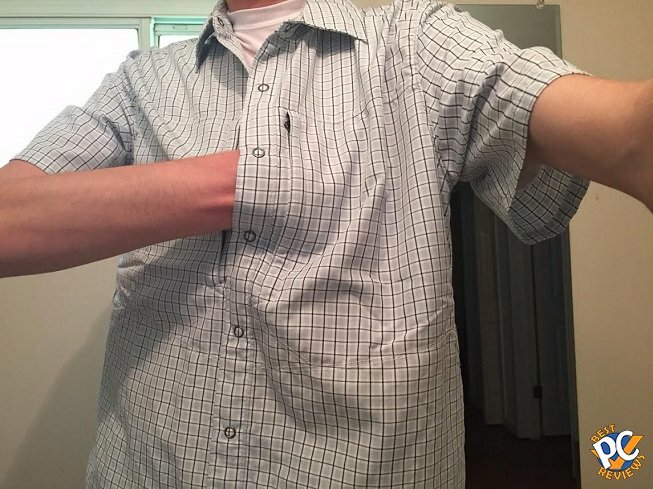 When you take the shirt off, make sure you reach to the bottom of the shirt, do not pull from the top as you may destroy the shirt. The material is very sturdy though. 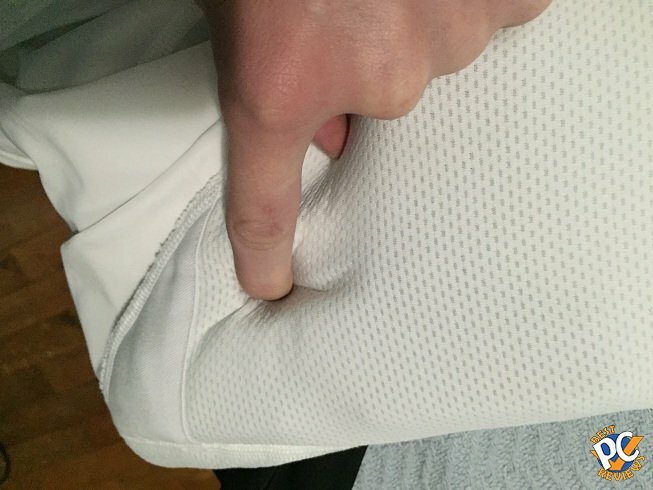 From my experience, in room temperature, there shirt holds up well and is really comfortable for first couple hours, but once there was some sweat, the shirt became more and more uncomfortable. Even though I was in the room temperature most of the time, when I removed the shirt, the shirt appeared wet in some parts. 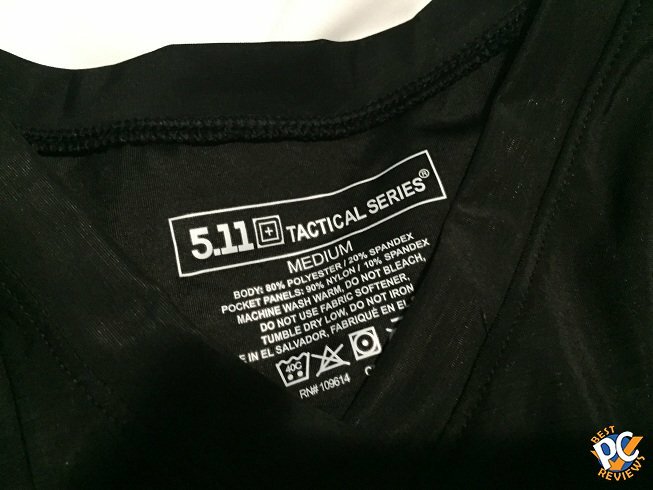 I am not really happy with the "Moisture Wicking Technology" the 5.11 made there. Most of the time, I wear cotton undershirt for work (which includes field visits to offenders in hot Florida summers) and I don't have issue with the cotton shirts at all. 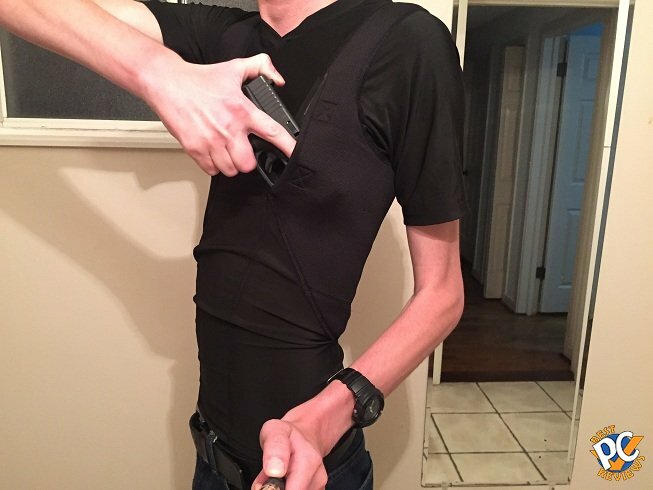 My opinion is 5.11 should also make a cotton holster shirt. 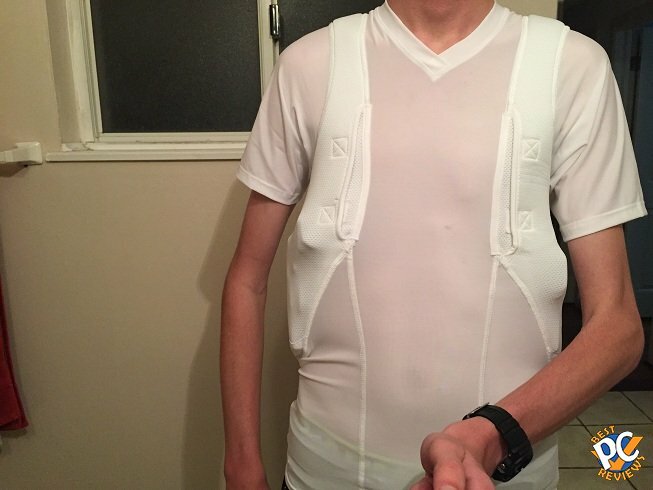 With that been said, the shirt's comfortably would work just fine in room temperatures and in colder environments, but outside in hot summer will not work at all. 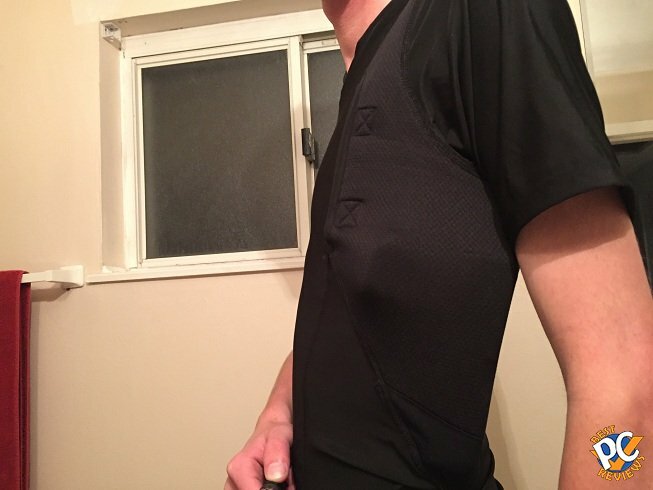 I tested and reviewed crew-neck and V-neck shirts. The firearms I tested the shirts with are Kel-Tec P40 and Glock 26. Both of the firearms are fairly small. The shirt handles these firearms really well. It did not make any difference to me whether I was armed or not. 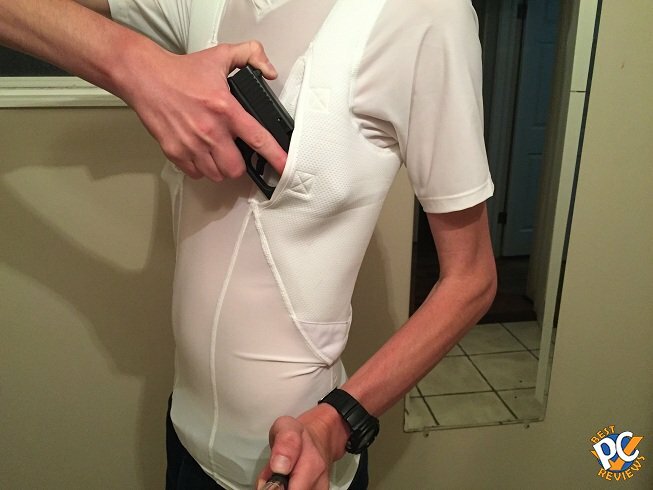 There is sufficient padding between the the shirt and the pockets, so the gun should not bother you. Now, my main concern. I am not a gun expert, but with my work experience and police academy training on firearms, I do not feel secure with carrying a loaded firearm in this shirt for one reason. No good trigger protection or trigger guard. I was able to depress the trigger with my finger from outside of the shirt. That is a big no no to me. I carry firearm in this shirt now ONLY if the firearm does not have a round in the chamber. 5.11 can also fix this issue by simply making the fabric material that covers the pockets harder. As long as it is impossible to depress the trigger from outside, I will feel safe with carrying a loaded firearm in the shirt. Now, if you really want to carry a loaded firearm, there are other couple options that may work. 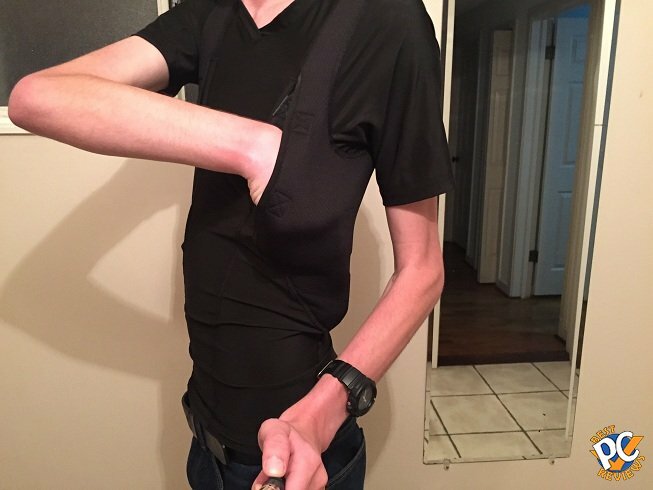 One is to carry gun there with a pocket holster inside the shirt pocket. I did not get a chance to try, but it should make it more secure. Another option is a little more complicated. The option is to get a trigger guard with cord. The cord can be attached somewhere inside the pocket, possibly requiring you to make couple holes at the bottom of the pocket. Then when the cord is attached there, put your firearm in the trigger guard and in the pocket. That way when you have to make a quick draw, the trigger guard should fall from the firearm once there is no more room for cord. 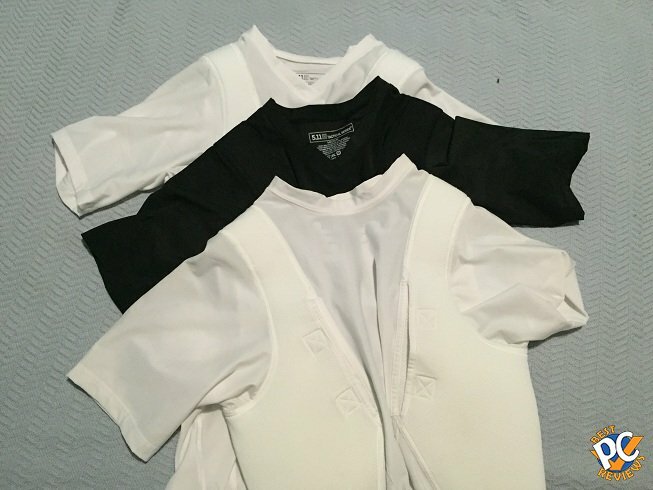 I am not sure how to make the holes though as it may damage the shirt, causing the hole or holes to expand. With that been said, 5.11 holster shirt is the best shirt on the market. Since I will be sending this review to 5.11 as well. Here is couple things 5.11 should consider. •	Change out the shirt's material. Make it cotton (or at least have a cotton option). I never had any issues with cotton undershirts and honestly think that cotton material is the best material for undershirts. 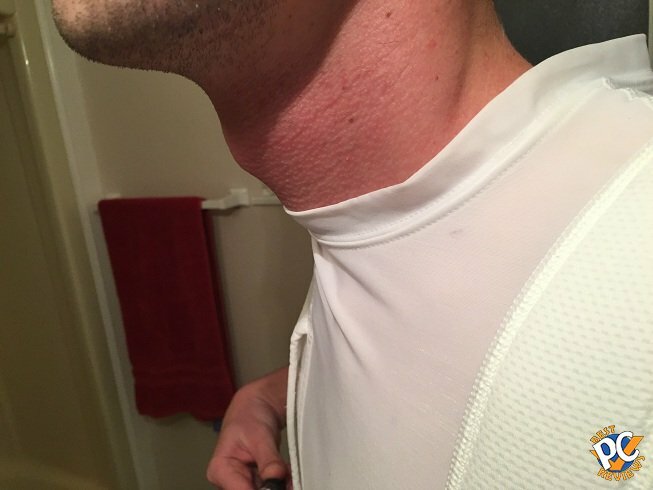 •	For crew neck shirts, expand the neck size. 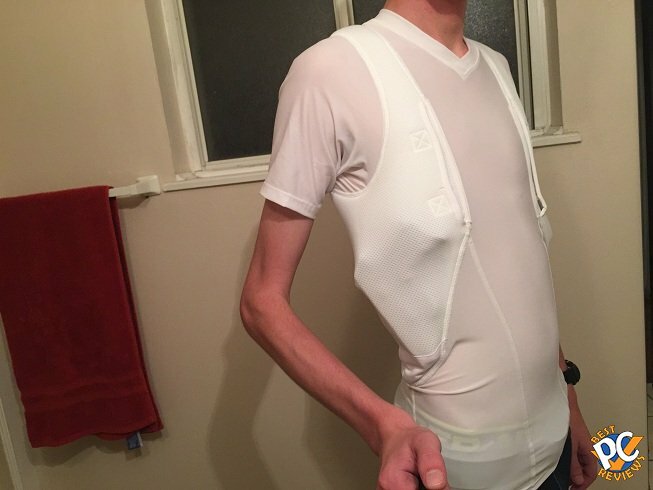 I have seen many reviewers complaining about the size, as the current neck size is too tight. 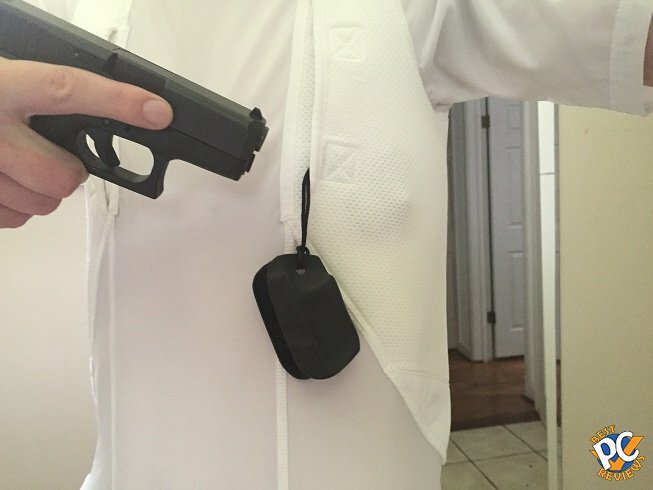 •	Make better outside protection for trigger in the pockets. 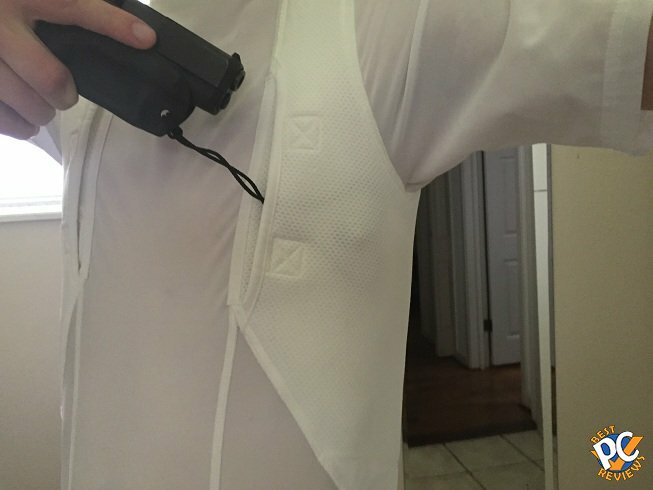 Make harder fabric to prevent any possible accidental weapon discharge. As I mentioned before with using external trigger guards with cord, it should work fine in my opinion, but the shirt will need to have a hole or two at the bottom of the pocket, to attach a cord from the trigger guard. If all there three points will be addressed, the shirt will be perfect. I am willing to pay even more for the shirt. 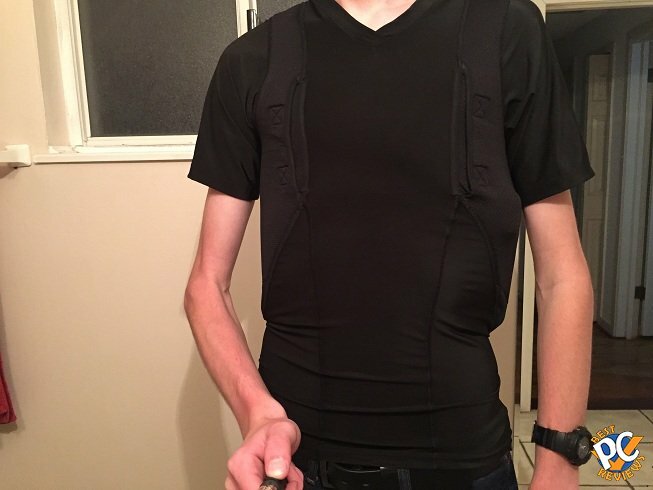 With that been said, 5.11 holster shirt is still the best holster shirt available in my opinion. Especially for people living in the cold area climates, 5.11 holster shirt will be their number one choice.